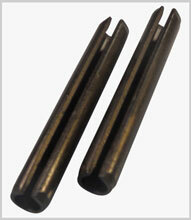 Also known as slotted spring pins they are produced in self-colour carbon steel or stainless steel. Their design allows the diameter to reduce as the pin is driven into an appropriate sized hole thus creating radial tension keeping the pin in place. Related to coiled spring pins which operate in a similar way but provides for greater shock absorption characteristics.